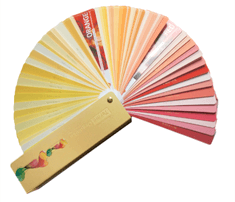 A color tool that is easy to use and widely used. 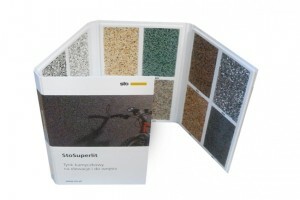 It is designed for presentation of paints, fabrics, films, veneers, laminates, as well as grouts, plasters and mortars. Books are reliable and the most popular tool for the presentation of plasters, however, the presentation method can be adjusted to different products. We can produce any form based on the number of presented samples. We make molds of any shape and size ourselves. These are made in any desired size. White PVC, colored PVC or laminated board. Available printing options: offset, screen print or digital print. Our offer covers elements of POS display systems, made according to the customer’s design or our own templates. This offering includes exhibition stands and racks, dispensers and other stands for displays. We specialize in servicing the construction, finishing and decoration industry. Our offer includes fine, high-quality working and promotional clothing. Safety clothes are made of non-shrink, color fabrics manufactured in Poland. We print and embroider logos and other graphical markings. We realize projects in the field of printing adverts on scaffolding safety nets and winter covers.